The Opening Ceremony of the anniversary event of the 10th World Choir Games 2018 came up right at the beginning with a superlative – the emotions boiled up like never before in an Opening Ceremony, the audience got carried away and thus created a frolic atmosphere in the fully packed Sun Arena. The audience visibly indulged in the African program which featured cultural characteristics of this continent, such as traditional dances and music performances, e.g. 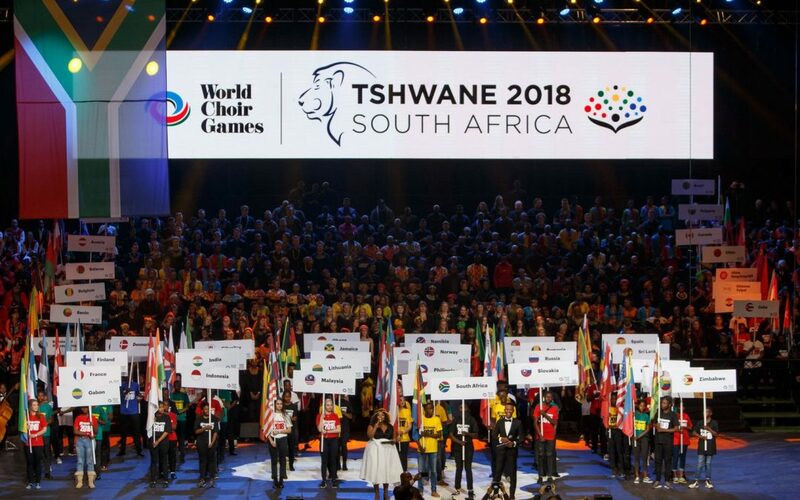 the official World Choir Games song of the Head of the Artistic Committee, Sibongile Khumalo, which she especially composed for this occasion: “Singomanqoba (We Are Conquerors)”. The audience constantly applauded, cheered and trilled and these emotions erupted during the African song „Shosholoza“. The South African participants in the arena jumped to their feet and this excitement carried away the participants of the other nations. None was able to step back and so the Opening Ceremony embodied an exceptional and great anniversary prelude for the upcoming 10 days of the World Choir Games 2018.